Acharya Shree Bikshuji was the first of the 'Terapanthi' ascetic. The various beliefs and teachings of the religious orders of those times greatly influenced his thinking and he chose to follow the way of the search for truth and to understand it. 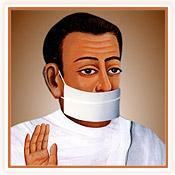 He studied and analyzed the various disciplines of the Jain religion thoroughly and on this basis he compiled his own ideologies and principles of the Jain way of life. Based on the doctrines he propagated, A. S. Bikhshuji rigorously followed the principles and thus set an example for all to follow. He showed the way for a life of discipline, purity and self-control. It was this way of life that was demonstrated by A. S. Bikshuji which came to known as Terapanth. Though gold is invaluable by itself it yet needs to be tested and molded by fire to win the admiration and appreciation of the masses. Similarly the life of A. S. Bikshuji was a prodigy of ups and downs that tested and molded him to become a supreme individual. While the first half of the life of A. S. Bikshuji relates to us how he faced ordeals and difficulties, the second half reveals (unfolds) the success and accomplishments. It is this narration of the life and times of A. S. Bikshuji which has been complied and presented in the Rajasthani language and serves as a fountain of knowledge of those traditions and times. In ancient times A. S. Bikshuji has been referred to as 'Bhikhanji', 'Bhikhamji', 'Bhikhu' etc. His followers piously referred to the great monk as 'Swamiji'. A.S. Bikshuji was a monk who was far ahead of his times. He rose above the present conditions of the society and strived to present and example to the people of all times of a life of discipline and truth. In pursuit of this objective he sacrificed material goals, honor and luxuries. By adhering strictly to the doctrines he laid down, he overcame the weaknesses of the body and human character and led the way of to a celestial life. He revolutionized the various principles which had become meaningless with the passing of time and gave conception and birth to these tenements. He visualized a systematic, well established and orderly religious sect and saw it taking shape through 'Terapanth'. To organize and stabilize this religious order he propagated the ideology of one guru and brought to an end the concept of self discipleship. In this way his ideology of one Acharya, one principle, one thought and similar thinking became the ideal for other religious sects. Swamiji was an ideal of tolerance, non-violence, generosity and equality and at every instance of his life he strived to stand against what was immoral and wrong in society fearlessly. The life of A. S. Bikhshuji sets out an example for human to follow of a life of the positive human traits. We hope that this presentation of the life of Swamiji will be an inspiration to all to lead a life of simplicity and self discipline.